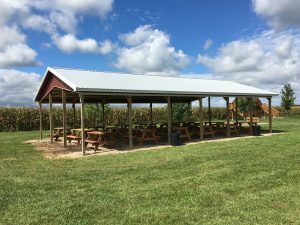 We do not host birthday parties, but you are welcome to celebrate a birthday at our Oswego farm during the fall festivities on Saturdays and Sundays. Our pavilion holds approximately 18 picnic tables. It is on a first come, first served basis. Since the pavilion is located inside the activity area, you will need to purchase an activity wristband for each guest. Children aged 3 and under are free. Anyone aged 4 and up (including adults) will need to wear the wristband. Click on Saturday & Sunday Festivities for more details. Use only the amount of tables you need since you will be sharing the pavilion with other farm guests. Please be considerate of others celebrating birthdays as well. You are allowed a maximum of 3 hours in the pavilion. You are responsible for child supervision and for cleaning up after yourself and party guests.